Tee & Penguin: Celebrating Dr. Martin Luther King, Jr. Since 1986, the third Monday in January has been designated as a federal holiday to honor the life and memory of Dr. Martin Luther King, Jr. As a parent, I'm grateful for the opportunity that today's holiday provides me to discuss the life of Dr. King and the importance of the civil rights movement with my children. 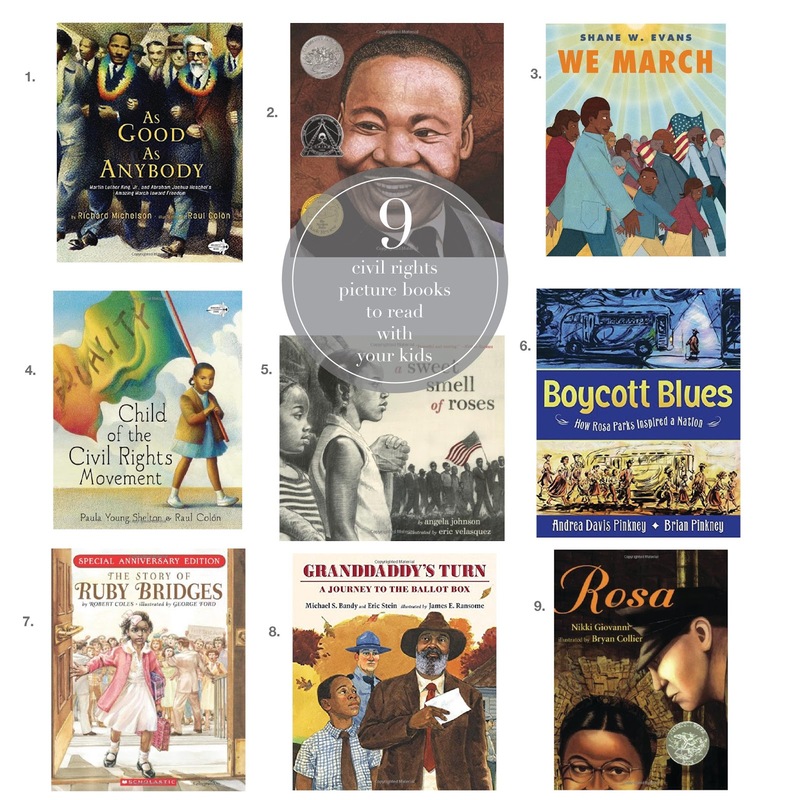 There are so many outstanding picture books about the power and importance of the civil rights movement, with heroes from Dr. King to Ruby Bridges, and reading them with my children the last few weeks has opened the door to many wonderful and unexpected conversations. During one discussion, I asked my son why he thought Dr. King was so important and his enthusiastic answer was, "because he changed the world!" Dr. King and so many others deserve to have their stories told and appreciated by citizens of all ages. These beautifully written and illustrated stories are an absolute inspiration and we hope you have the same wonderful experience reading and sharing them with your families that we did. 1. As Good As Anybody by Richard Michelson. This was one of my very favorite stories. It tells the story of Dr. King, a Baptist preacher from Atlanta and Abraham Heschel, a rabbi born in Poland- two remarkable men who joined together to fight bigotry and advance the common good. 2. Martin’s Big Words by Doreen Rapport. The winner of the Caldecott Honor, Coretta Scott King Award, and the NY Times Book Review Best Illustrated Children's Book, this book is outstanding. It seamlessly weaves the story of Dr. King's life with his inspiring words. 3. We March by Shane W. Evans. I loved this book, it tells the story of the 1963 March on Washington DC from the perspective of two small children. With beautiful illustrations and simple text, We March makes this pivotal historical event accessible to even your youngest reader. 4. A Child of the Civil Rights Movement by Paula Young Shelton. Written by the daughter of civil rights leader and former UN Ambassador Andrew Young, this is the true story of a child growing up in the Deep South while sitting around the dinner table with "Uncle Martin and Aunt Coretta." A story all the more beautiful because it is true. I especially loved the end, "And one day, when Mama and Daddy were too tired to march, too weary to cary us on their shoulders, too exhausted to fight another battle, the baton would pass to us and we would march on- children of the civil rights movement." 5. A Sweet Smell of Roses by Angela Johnson. Another wonderful story for very young readers, Roses pays tribute to the often overlooked children who participated in the civil rights movement. The charcoal illustrations are gorgeous and the faces of the marchers convey as much, if not more, of the story than the words themselves. 6. Boycott Blues by Andrea Davis Pinkney. A wonderful, rhythmic tribute to the men and women who participated in the Montgomery bus boycott. The boycott is often summarized by telling the beginning and end, but Boycott Blues captures how long it actually took for the protest to succeed (382 days). and the sacrifice made by its courageous participants. I also loved how the author and illustrator depicted Jim Crow as a metaphorical bird, it makes a difficult concept more accessible for younger readers. 7. The Story of Ruby Bridges by Robert Coles. I was thrilled to see this event in picture book format. The courage and determination of six year old Ruby Bridges and the unthinkable circumstances she started school in are told by Pulitzer Prize-winner Robert Coles. Ruby helped change our country and her story is one that will inspire children of all ages. 8. Granddaddy’s Turn by Michael Bandy and Eric Stein. This is the story of a young boy, growing up in the segregated south, who accompanies his grandfather on the momentous day when he has the right to cast his first vote. Despite the sad outcome of that day, the grandfather's example of pride and patience never leaves the boy. A powerful story of learning from the past and looking forward to the future. 9. Rosa by Nikki Giovanni. This Caldecott Honor book's illustrations are stunning and I enjoyed paging through the illustrations even more than reading the story. The text is a little dense and difficult to get through with a younger audience, but it is full of wonderful detail and helps readers understand the context of Mrs. Parks' protest and the critical role it played in the broader movement.